In 1921, Brighton was the second most densely populated county borough in the country after West Ham and, as a long-established town, a good deal of its housing was in worse condition than that of the London suburb. If you associate it with Regency gentry or happy seaside holidays, this blog will show another side – a town with many slum homes and an urgent need to better house its working-class population. But if council housing was the solution (as was accepted by nearly all in these days), the problem of making it affordable to the poorer working class remained a conundrum. Brighton Corporation had begun slum clearance efforts back in the 1890s and even built a small number of homes to rehouse – though at rents they couldn’t pay – some of those displaced. In 1919 much remained to be done; the local Medical Officer of Health estimated 3152 new houses were needed to ensure a decent home for all. The Conservative-controlled council approached the task with the idealism typical of that early post-war period. This lay-out is situated in an exceedingly beautiful hollow in the Downs, and it is due to the steepness of the hillside on which it is situated, that a very informal system of planning has been adopted. 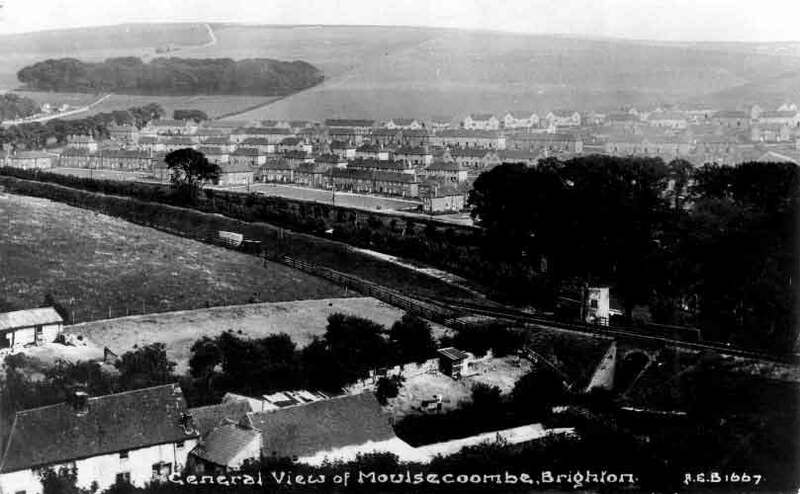 There are many examples in Sussex of villages nestling in the hollows between Downs where a continuous green traverses the whole length of the village, and it is with recollections of these beautiful valley greens that the central feature of Moulsecoomb has been designed. Such was the anger and frustration that some locals took to direct action. 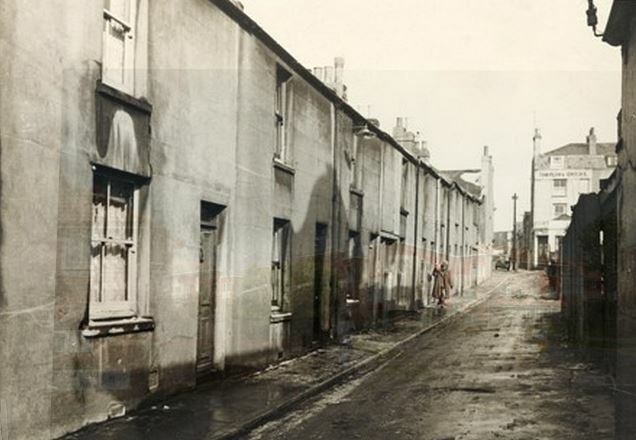 Up to 60 empty, privately-owned homes were occupied in the early 1920s and squatted until an appropriate rent was agreed between owners and would-be tenants. 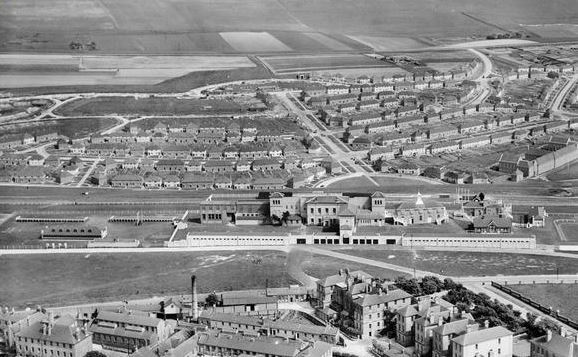 A second Corporation scheme, its layout also designed by Adshead and Ramsey, was built one mile to the east of the town centre in the Queen’s Park area between 1923 and 1926. This time considerable efforts were made to lower the costs of the 450 homes through omitting parlours, placing toilets on the ground floor and building to a much higher density. 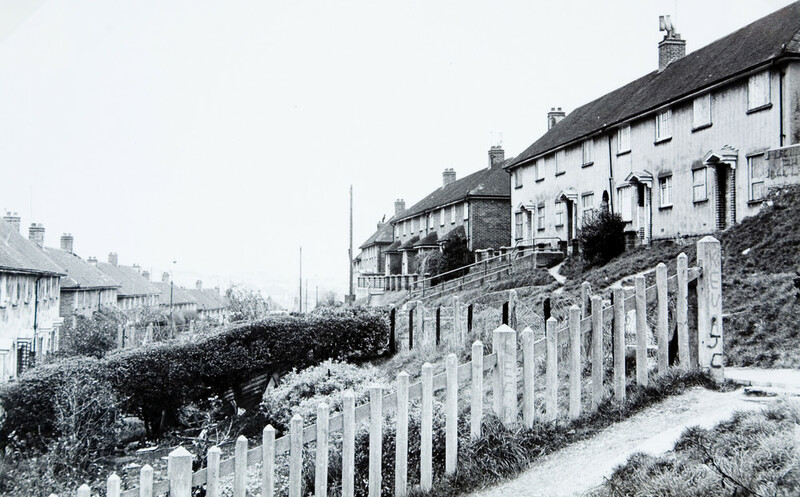 A further 46 acres of land was acquired from Falmer in 1925 to form the North Moulsecoomb Estate, with better quality homes and a return to garden suburb principles, of 390 houses. 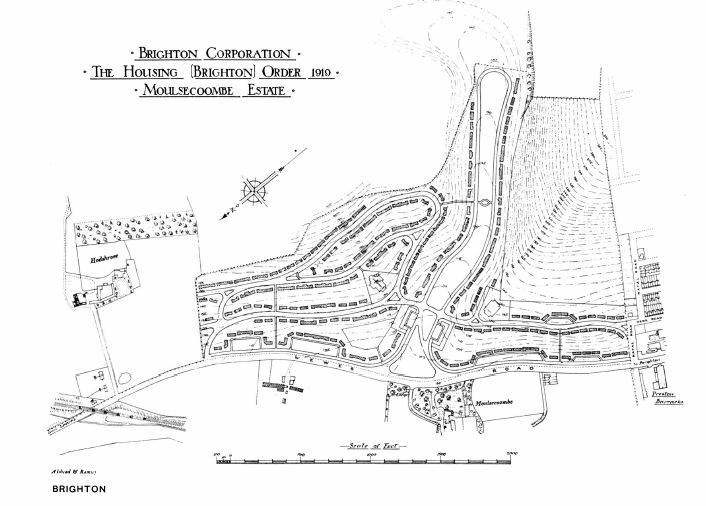 This land too was annexed to Brighton – in 1928 – alongside Ovingdean parish to the east of Brighton where construction of the large Whitehawk Estate began in the late twenties. For the most part the tenants of these slums have to live near their work and they will not remove to the suburbs; they are generally so poor that they cannot afford the cost of travel to and from the centre of the town. Another difficulty is rent; the average these people can afford is about 8s a week, they cannot pay 15s a week or even the reduced rate of 12s a week. He added, less sympathetically, ‘another important point…that many are dirty and unsatisfactory tenants who would quickly ruin a new house’ – a common prejudice of the period that we’ve seen expressed in the Knowle West Estate in Bristol, the North Hull Estate and elsewhere. The general design of the houses is made up of several designs intermixed, with the front elevations treated with rough cast in various colours and designs and Sussex bricks, so as to produce an attractive whole and thus avoid the too frequent dull uniformity in design without necessarily increasing the cost. Back in the 1930s, Brighton was redoubling its efforts to house displaced slum dwellers. 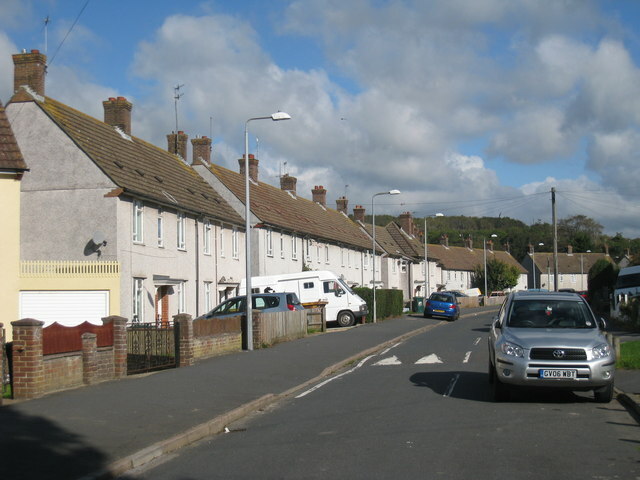 Housing was extended up Bevendean Valley to form the Bevendean Estate in the early thirties and land was purchased in 1935 to create the East Moulsecoomb Estate and in 1936 for the Manor Farm Estate, the latter to house principally those displaced by the Carlton Hill demolitions. heard of housewives with empty larders, of sick and ailing people in homes without the bare necessities of life, of children who sit a nights in lightless, fireless kitchens, because there is no money for the gas-meter, no coal for the grate. Though such a description might be taken as journalistic overstatement, it is given credibility by a more objective study conducted in the same year. Marion Fitzgerald found that of the 79 county boroughs in the country only Croydon and Newcastle had a higher number of properties let at over 12s a week. 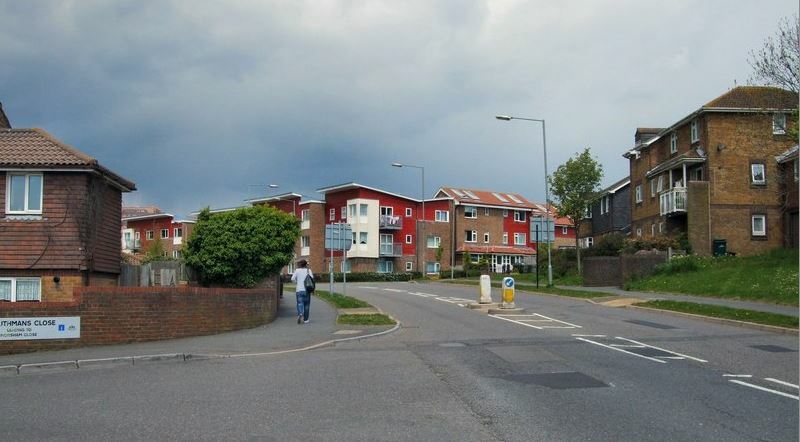 On the South Moulsecoomb Estate – the most expensive to build – rents reached 27s a week. Unsurprisingly, it was tenanted by ‘the better paid working classes and some middle class people’ who could afford such levels. When war broke out, this issue remained unresolved. 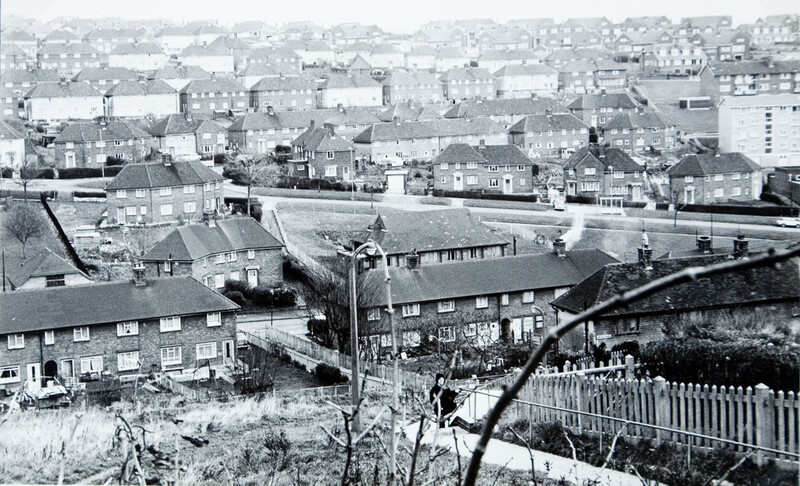 Brighton had built 4285 new council homes between the wars but Corporation policies had done little to alleviate the working-class poverty of which housing was only one aspect. After 1945 new dynamics shaped working-class lives. Many of these for a period of time – full employment, increased and more widely spread affluence, and a strengthened welfare state – have been positive. But not all have benefited and earlier gains have been lost. 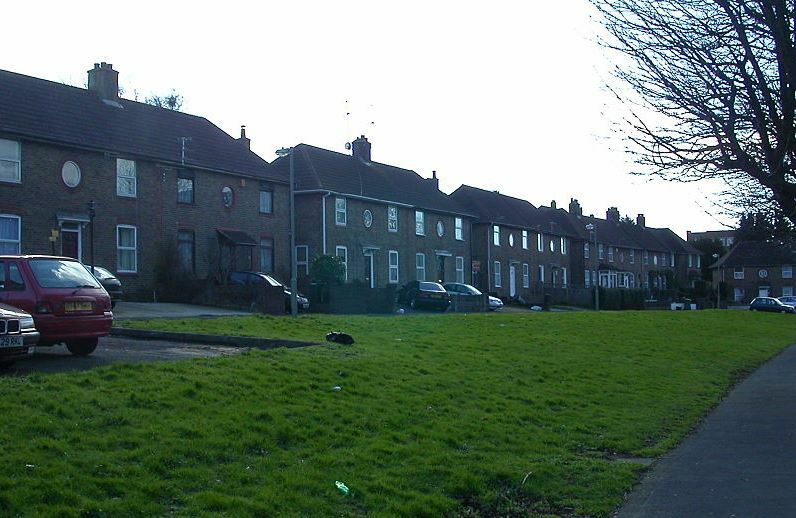 In 2010, the Whitehawk Estate was one of the most deprived areas in the country – in the bottom five per cent nationally. I could quote employment figures, educational attainment statistics and so on but let’s get this down to basics – men on the Estate die on average seven years earlier than their counterparts in the rest of Brighton. (8) The struggle to ensure that our social housing provides not only a roof but a measure of social equity remains. My thanks to the Regency Society with the Royal Pavilion and Museums, Brighton and Hove for allowing use of images from the James Gray collection. My Brighton and Hove is a superb website which contains more history and many memories of Brighton’s council housing over the years and much else. A useful reminder that housing is part of a whole and needs to be integrated with other issues. 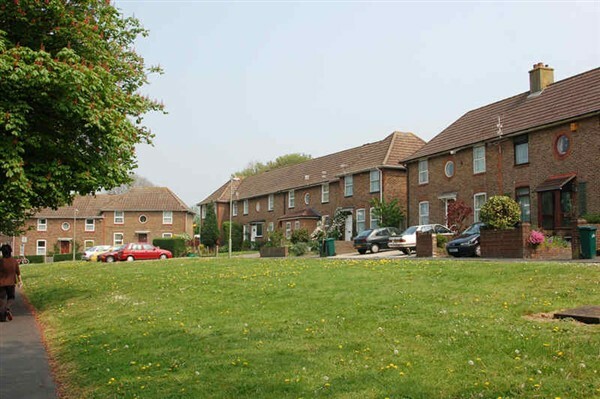 This 5-Star, really expert, blogpost isn’t about Hove but don’t miss reading: Brighton’s Interwar Council Housing Estates. Really interesting, as always, and some clear parallels with today’s (un)affordable social housing.